It's January, normally the bleak midwinter for this part of the country, and therefore a perfect time to talk about...pumpkins. "Pumpkins?" you ask. "MOE, don't you know that the season for pumpkins is long past?" We bought these pumpkins two weeks before Halloween. That's right. We've had them for nearly three months now. They not only survived Halloween, but they also survived Thanksgiving, Christmas, and New Years. They even survived the great blizzard of 2012. And I suppose this is exactly what I deserve for trying to avoid carving them. As you know from my post from way back when about dyeing Easter eggs (link), I'm not the best cultural attaché when it comes to the messy traditions. In fact, in the nearly 13 years Ren and I have been married, we've only carved pumpkins three times. Once because it was Ren and Big Sissy's first Halloween in the US, once because we were at a party and everyone else was doing it, and once three years ago, our first year living back in the States when Sky and Pink P were old enough to appreciate it. Impressive for a guy who'd only carved two other pumpkins in his life. Our friendly pumpkin lasted less than 24 hours before someone smashed it in the road in front of our house. Sky took it so well (link) I hesitated to repeat the crushing pumpkin crushing two years in a row. Then we had another kid and Ren's back went south, and somehow no one mentioned carving a pumpkin. That is until this last Halloween. This time Sky and Pink wanted pumpkins and they wanted to carve them. "Shouldn't we draw faces on them instead?" I offered, lamely, hoping they would choose the easier way out. "Nah, if we do that, they'll look terrible," Sky reasoned. "I want to cut out faces and put a candle in them!" Pink P chimed in. "But if we carve them. 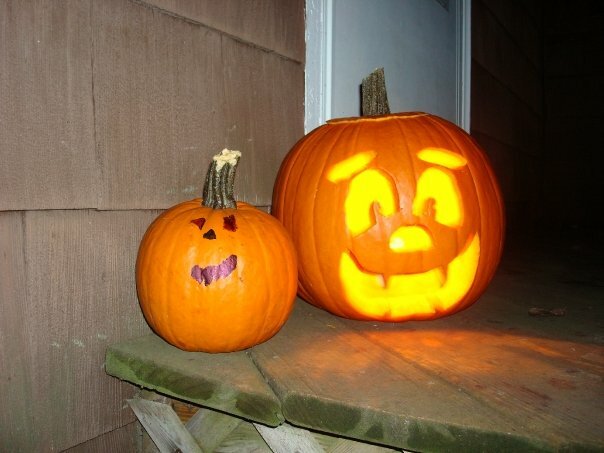 They'll rot quicker," I explained, reminding them of the moldy pumpkins we'd seen at a friend's house. A dirty trick, I know. I mean, who likes moldy pumpkins? For days, the conversation was at an impasse. Then we got busy and went trick-or-treating, celebrated birthdays, had a skating party, wrote letters to Santa, and generally forgot about the pumpkins. And, now, three months later, there they sit on the back porch. As permanent reminders of my bad parenting. Of my failure to embrace the hokey, messy traditions that should be a part of every kid's childhood. And, as logistical challenges. After all, I promised the kids the pumpkins would last longer if we didn't carve them, so now I can't even throw them out. And it's way too late in the season to sit them on the front porch and hope someone will smash them. At this rate, these darn pumpkins may well become family. Anyone know how long it takes a pumpkin to decompose naturally? Forever. Unless I chuck ours in the back hedge for the deer to eat in a misguided attempt to keep them away from my plants!! Mayzie insisted on cuddling with her pumpkin every day since buying it in mid-October. Today, I snuck it into the trash can during her nap when I found a rotting spot. This one was inside and well-loved. No telling how long yours will last with all that refrigeration. One of our three pumpkins went uncarved (the other two got carved at day care-- a dad activity). 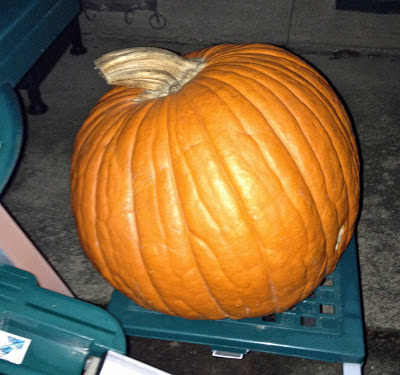 So the uncarved pumpkin sat on the kitchen counter for a month and now it's out back under the bird feeder. I thought maybe a squirrel would nibble on it. 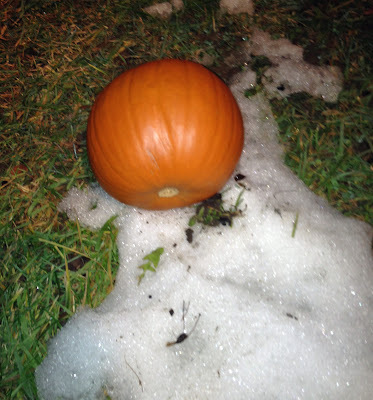 In my 5th grade science class out teacher let a pumpkin decompose on the window sill (indoors) for the whole school year and I think of this often. It was called "Punk Rot." Yep, outside forever. In a warm grad school office (note: the pumpkin was NOT mine), just a couple of weeks and then it will become a putrefied mess you wish you had a shovel to remove it with. As a "science experiment" you can bury it in a pot of dirt and do nothing and then watch pumpkins grow in the spring... forget to water them, and you won't have to worry about what to do with your crop in the fall. That's what I do, anyway. Mayzie was adamant upon hugging along with the woman's pumpkin every single day because purchasing this within mid-October. These days, We snuck this to the garbage may throughout the woman's snooze after i discovered the decaying place. That one had been within as well as well-loved. Absolutely no informing just how long your own can last along with everything refrigeration.